Tuberose has a fresh earthy aroma with floral, spice - like notes. This fragrance is a bold floral blend of tuberose, lily and rose with musk and a touch of mint. Tuberose is a tall, narrow perennial with long thin leaves and a tuberous root. The aromatic flowers are large and white. Tuberose is very popular in the perfume and aromatic industries. 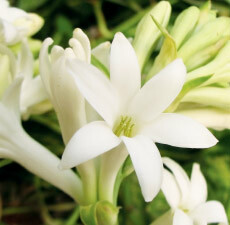 Tuberose is cultivated all over the world for their flowers, but specially in Egypt, India, China, France and Morocco.